Economical polyester injection resin solution for anchoring into masonry. 2-component resin and hardener which are mixed and activated when extruded through a static mixer. 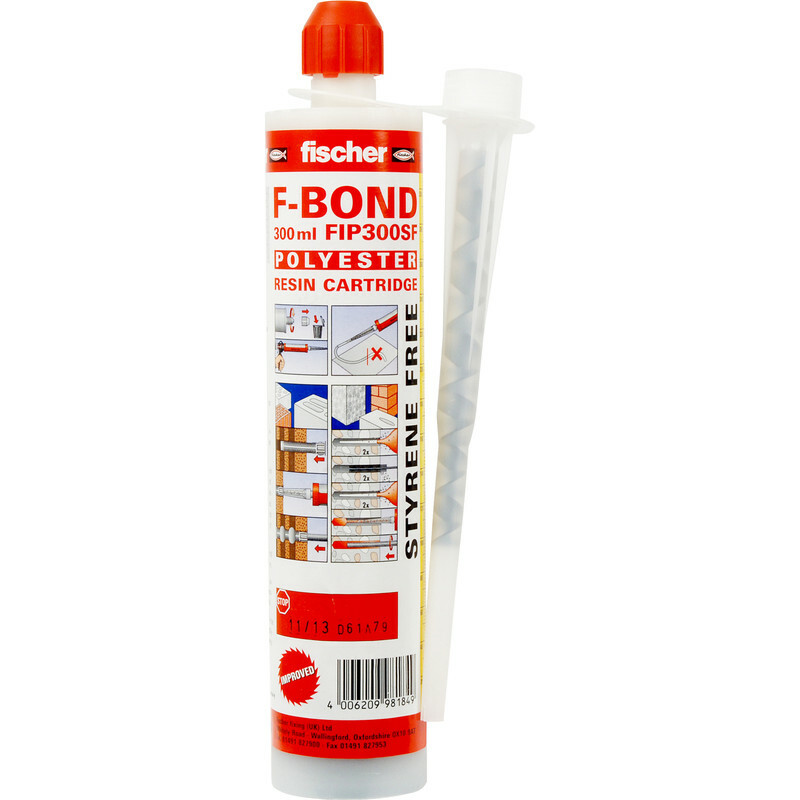 Fischer Styrene Free Resin P 300 SF 300ml is rated 4.7 out of 5 by 13. Rated 5 out of 5 by newkiephil from exactly what was needed This product is fast setting, strong and easy to use - just make sure you have the right gun for it, and a spare tube meant I could use every bit of it. Rated 4 out of 5 by Critical 1 from Good glue I've used this several times with great success for varying gobs glueing studding into stone and concrete. My only gripe is it needs to come with at lease 2 nozzles or TS need to sell them separately. Rated 4 out of 5 by Misteracme from Incredibly strong resin Stronger than you can imagine. You have to work quickly with this resin & have all studs/ bolts ready, all holes pre- drilled. Sets very fast. Once set there's no going back. Doesn't go as far as expected. Rated 4 out of 5 by minetymenace from A must have. I have used this sort of resin many times, but this is the first time I have used this brand. If you have never used this stuff (or similar products) I should point out that you will need a special gun, which are more pricey that your average mastic gun. It is also handy to have a number of spare nozzles as it is a two part adhesive that is mixed in the nozzle. Therefore as soon as you have finished your bonding job, you need to remove the nozzle, wipe clean the end of the tube and reseal with the tube with its cap. The mixed glue will set in a used nozzle, they are disposable. What does it stick? Pretty much anything. I have used it to anchor threaded bar into cinder block wall to hang shelves, broken lintels on sheds (not advocating that it will support another story!! ), sealing around exterior sockets, patching small holes in brickwork, repairing gullies....for permanent jobs where you need to stick buildings together, this is the stuff. What I noticed about this purchase: There was about 5cc or 10cc of brown watery fluid in the mix, I have not seen this before and thought the product may have separated, I checked the date code and it seemed to be in date but had clearly been sitting on the shelf a while. Despite rotating the tube every half day for a few days, it was impossible to re-mix it back into the goo, so I carried on. Compared with other similar products (costing 50% more) the finished set product was similar, but it took a lot longer to set, about 40 minutes. This may have been because of the separation previously mentioned, but if you wanted to stick a table to the ceiling, your arms wold get tired. No, of course you are not going to do that, but the point I'm making is that you want to apply the product and have it set in a couple or 5 minutes (not fully maybe, but enough to say support a piece of threaded bar in a hole), so you can get on with something else...gone are the days when I can afford to stand around. So, if we all bought more, maybe the stock turnaround would be better and so would the product, if you are DIYing, and charging by the hour, this is ideal, but have to mark it down on its setting time. The price is spot on. Don't get it on your hands or cloths, wear gloves, no really, wear gloves. Rated 5 out of 5 by Destroy it yourself from Rock hard when set Used to set Fischer bolts into brick course so I could hang a big gate. Tip: check your caulk guns working before you crack this open. Mine was goosed. Made the job much harder. But quality product.